Ever since last fall, we've had a frog living in the canning closet. We've had frogs in the house before -- it's not unknown for me to find them swimming in Lydia's water bowl in the morning -- but this little amphibian lived for at least five months in the dark recesses of the closet. I have no idea how he survived -- my mother suggested he might have munched on spiders -- but survive he did. 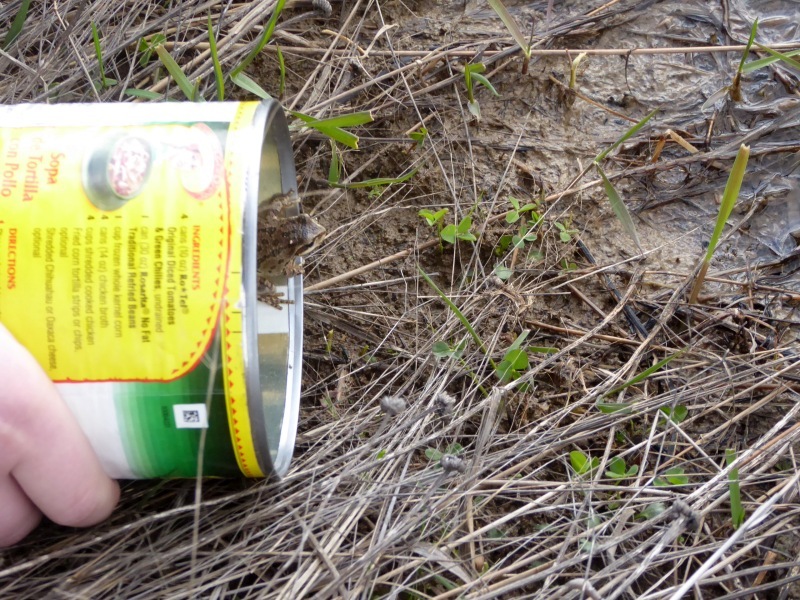 I kept a flashlight and tin can on hand just in case I should be lucky enough to spot him, but he was a hard little bugger to locate. Short of literally emptying the entire closet, we couldn't pinpoint him (since, of course, he would clam up whenever we tried). But at least once a day, sometimes more often, he would limber up his voice and serenade us at full volume from somewhere deep in the cavernous depths of the closet. 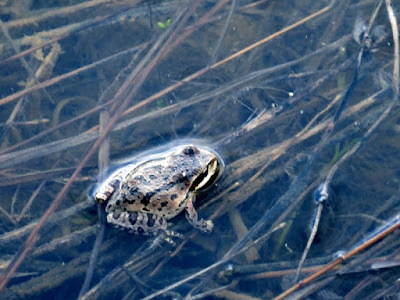 Frogs, even little ones, are surprisingly loud when confined indoors. We have an air popcorn popper, and whenever we fired it up, the frog began singing at the top of his lungs. We grew rather fond of him, invisible as he was, and Younger Daughter named him Nigel. A few days ago, he began croaking particularly loudly. I interpreted that to mean he was in a more open location in the closet. I grabbed the flashlight and can and crept close to the door. Aha! There he was, sitting atop one of the bulk food buckets, caught in the act with his throat expanded to full capacity like a bubble about to burst. Gently I scooted him into the can and put my hand over it. "Guess what I got!" I said ungrammatically to Younger Daughter, going into her room. We were both delighted to have captured Nigel at last; not so much because anyone particularly minded having a frog in the house, but because the poor little guy deserved to be outdoors, not stuck in an unnatural dark place, especially after so many months. 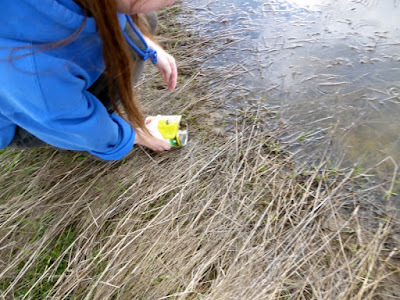 Together we carried the can out to the pond to release him. 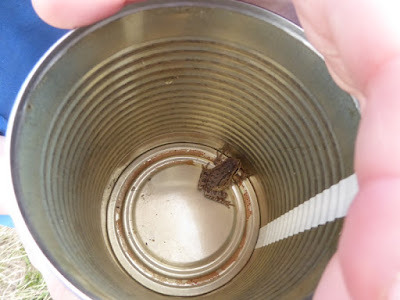 After I took my hand off the top of the can, he seemed eager to get out. 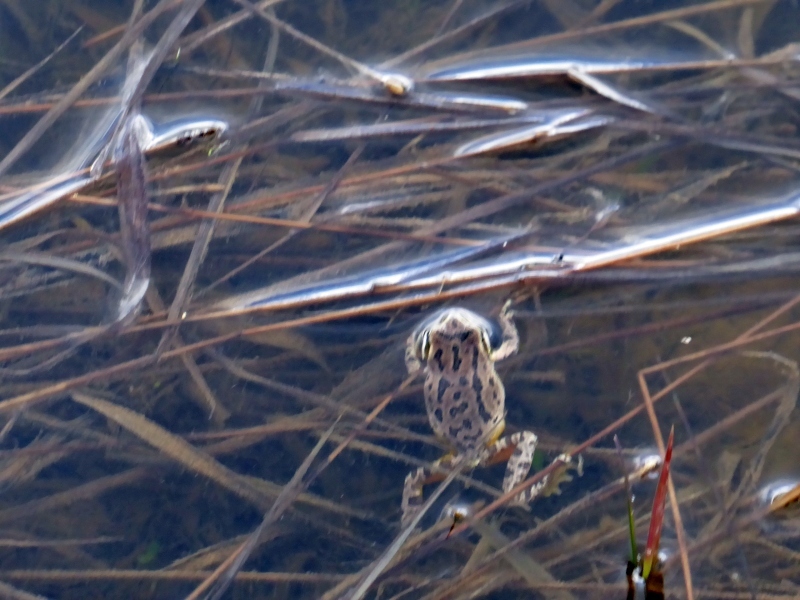 It was a gloomy, chilly, windswept day, but such conditions don't seem to bother frogs. Younger Daughter gently laid the can down by the water's edge. In no time, Nigel had made his way into the water, where he seemed surprised (and hopefully pleased) at the sudden change in his surroundings. I certainly hope Nigel lives a long and happy frog life after his confining winter. 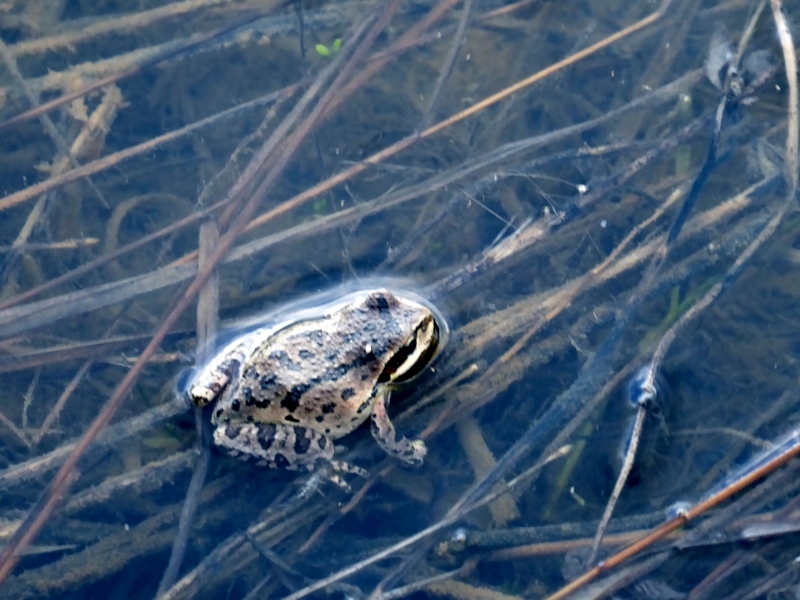 On the way back through the garden after releasing the frog, Younger Daughter suddenly stopped and crouched down. "Come see what I found!" she called. "They're still warm!" Four eggs, neatly pointed toward the center, constituted the humble nest of a killdeer. 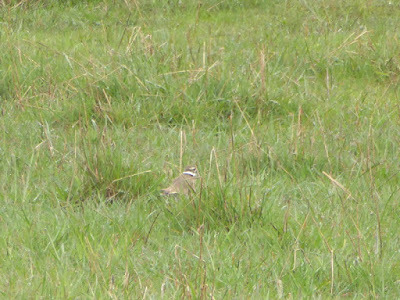 Killdeer are a handsome type of plover and are very common around here. They're famous for their "broken wing" diversionary tactic to draw predators away from a nest. I often hear their lonely "kill-deeeeer" cry even during the night. Their coloring may seem distinctive, but I can tell you from experience it's amazingly cryptic. 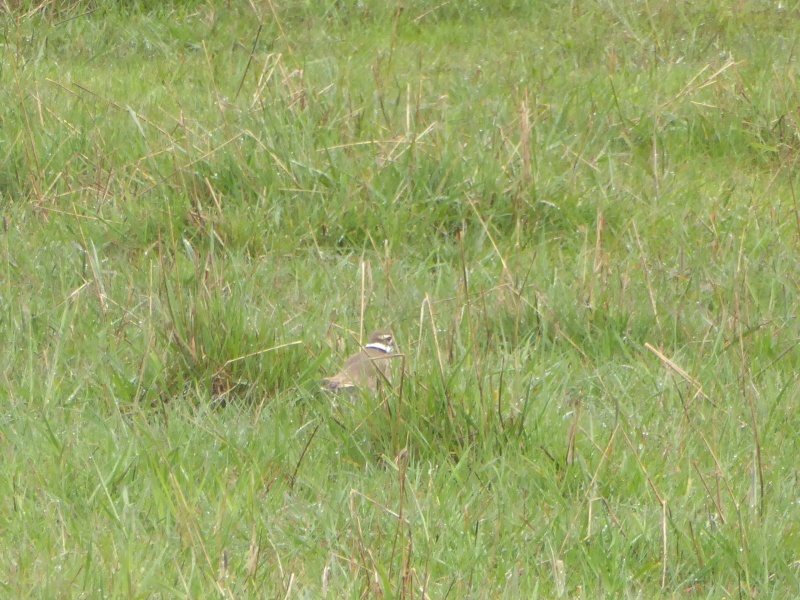 When standing still, and unless you know exactly where they are, killdeer are very hard to spot. Needless to say the eggs are similarly cryptic. They have to be, laying brazenly on the open ground as they do. The mother hovered anxiously nearby. This nest is smack in the middle of the garden, near the corn tires, so the mother will have to put up with me working nearby, but I'll try not to disturb her too much. 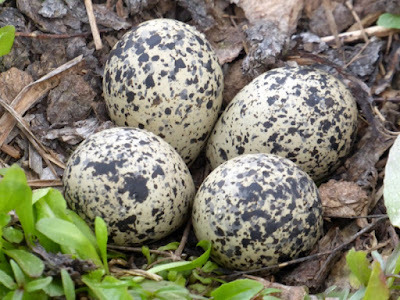 See how camouflaged the eggs are? The nest is right in the fold of a tarp. 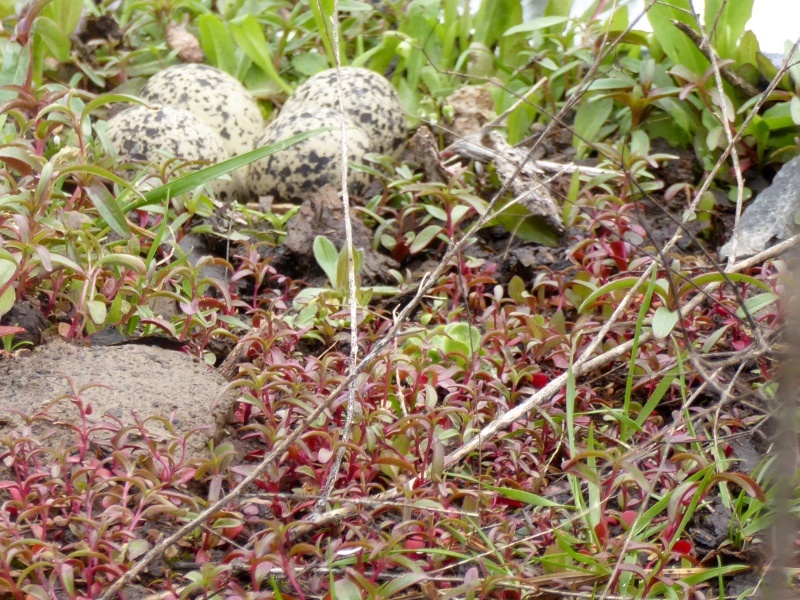 The next day, I brought a friend out to show her the nest, and we saw the mother bird on the eggs. We didn't get too close lest we disturb her. 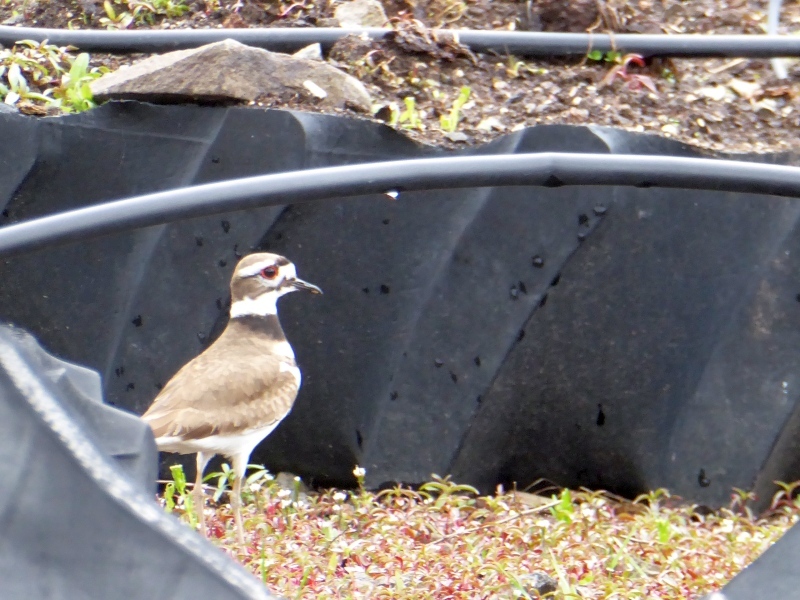 Baby killdeer are precocial, meaning they'll be able to run shortly after hatching. When these eggs hatch, chances are very good I won't ever see the babies. Until that happens, though, I'll enjoy watching the nest. Long live Nigel! I've got several frogs around my place here in North Carolina. They like to lay their eggs in my rain barrels. 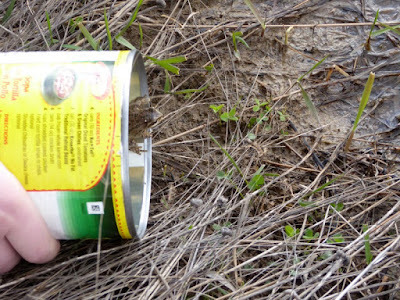 I scoop them up in a cup and take them down to the creek and release them into the slow moving water. The adult frogs will get in the downspout of my gutters and that increases the volume of their calls. A fan running at night drowns out the sound. Where I work there are several killdeer - they make their nests in the gravel of the parking lot median and whenever someone walks by they do the broken wing dodge. 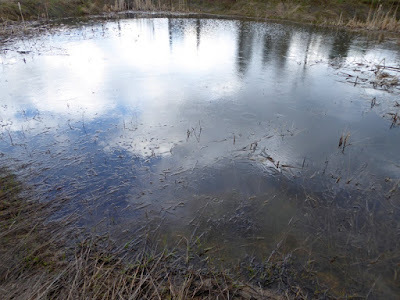 Have several frogs that spend the winter under the house. Can really hear them when laying in bed and is all quiet. Makes me laugh and shake my head. 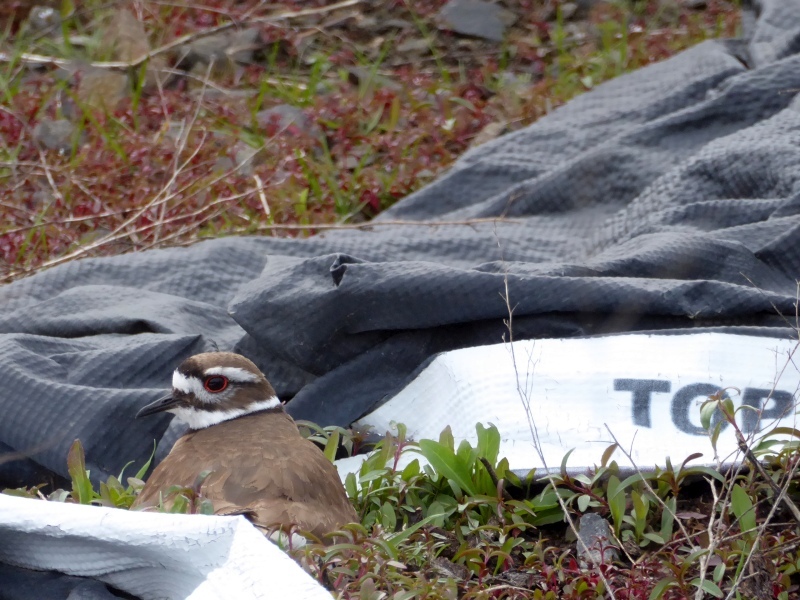 We had a killdeer experience just like that, three eggs on the ground. 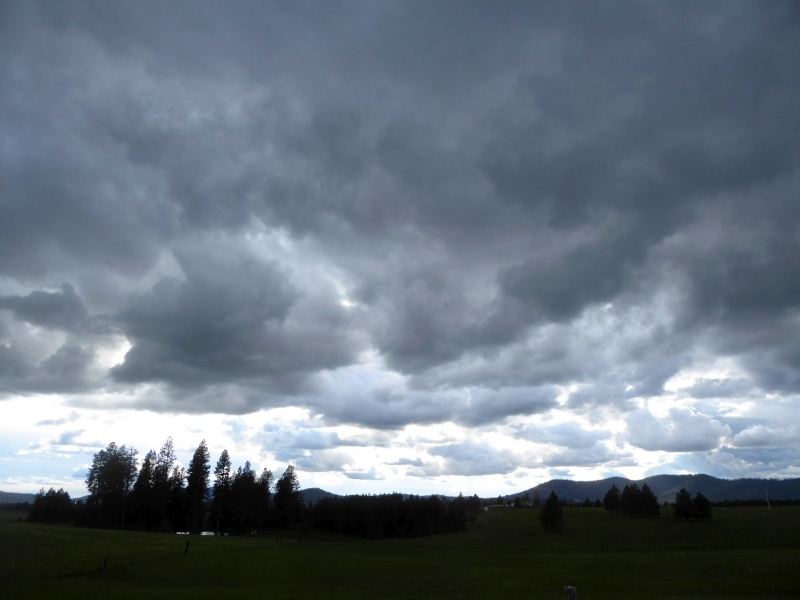 Then we had rain and more rain and now the eggs are gone. No sign of hatching residue anywhere around. 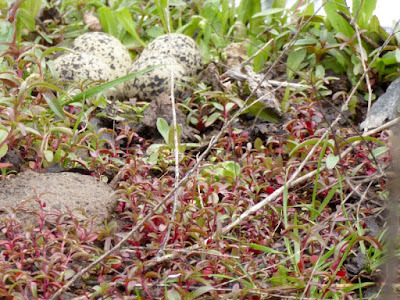 I hope the eggs were able to hatch, but the weather was so bad, so wet and so cold. 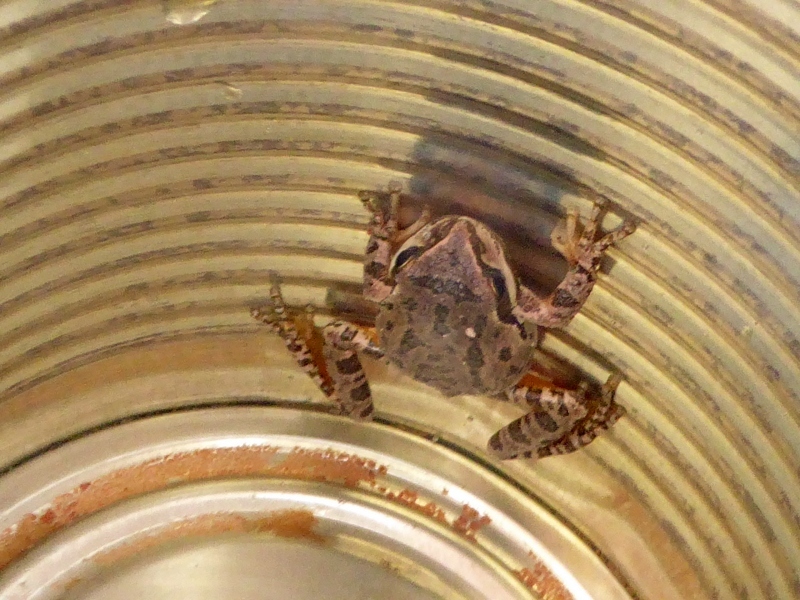 Sometimes we find those little tree toads suction-cupped onto the outside of our glass patio doors. I love listening to their serenade. Next time one of Nigels friends get stuck in your house set out a shallow dish of water. Like Lydia's dish, they'll be looking for water after several days. Might make it easier to catch them.